Wow, I can finally take a breath after traveling for almost two weeks. During my travels I was able to exhibit at a regional AIA Trade Show in Athens, Georgia and attend our very own DHI Convention in New York City. Please be patient as I try to catch you up! Living in FL I thought I was familiar with southern hospitality. I was wrong. The AIA GA members made an incredible impression on me with their warmth and sincerity. 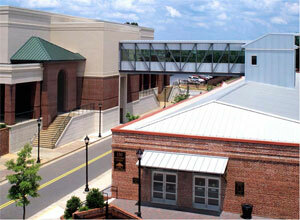 The show was located in the Foundry Classic Center which was a mix of beautiful old brick and modern conveniences. The AIA GA Board of Directors has done a great job at educating their members to the importance of making the exhibitors feel welcome. Having attended many trade shows in the past I have never had so many conference attendees come up and thank me for taking the time, effort and money to exhibit. They spent time at each booth to really learn what each exhibitor had to offer. I attended the National AIA show in Miami and was overwhelmed. My friend was exhibiting at the show and I was able to spend time with her at her booth. It was chaotic to say the least. Her boss said he would probably never spend the money to exhibit at the national level again. The GA Design Conference was entirely differently. It provided a more intimate setting to allow the architects to discuss their specific needs. Points made to us were interest in more Grade 1 lever designs and the need to meet government specifications. This experience has lead me to express interest in exhibiting at the AIA Florida Annual Convention being held at The Breakers Hotel in Palm Beach July 19-22, 2012.. The AIA South Atlantic Regional Conference will be another possible opportunity to exhibit. It is being held September 19-22 at the Loews Atlanta Hotel in Atlanta, GA. It brings together architect membership from Georgia, North Carolina and South Carolina.